A traditional cake but still one of my favourites, it’s good for feeding the masses too! Makes 1 x 8″ Square cake. Prepare your tin lining the base and sides with baking paper. No, I didn’t buy this tin because it’s pink. Measure out the sunflower oil in a jug and add the eggs. Whisk them together to break up the eggs. Now weigh out the golden syrup and set to one side. In a large bowl combine all the dry ingredients – flour, spices, sugar and bicarbonate of soda. Yes, I’m using a casserole dish, I couldn’t lay my hands on a mixing bowl…..don’t tell me you don’t do that….?! Add the oil, eggs and syrup and give it a good old mix up. Now grate the carrots, it’s about this many… (if they’re piddly little ones like mine). Peel them first but keep the tops on – something to hold whilst you’re grating. Officially I hate grating carrots but I hate hunting for the food processor attachments even more. Add the carrots and stir it up, pour it all into the tin. Bake it in the oven for 45-50 minutes, check its done inserting a skewer and making sure it comes out clean. Transfer it to a wire rack to cool completely. Mix up the frosting, you only need a ½ quantity of this recipe – so 35g butter, softened 100g cream cheese and 200g icing sugar following the instructions. Spread over the top of the carrot cake and squiggle with a fork. Cut into 16 pieces, more if you’re feeling stingy. To make the carrots take the sugarpastes and roll them into fat sausages. Cut each sausage into even slices – that way all your carrots will be the same sizes. Using the end of a paintbrush poke a hole in the top. Carrot tops – roll a small ball of green, taper the end and then flatten the ball part with your fingertip. Using a sharp knife make three or four cuts to separate it into leafy bits. Poke the pointy bit of the carrot top into the paintbrush hole in the top of the carrot. Using the knife score some lines gently down the body of the carrot. Because of the frosting this cake should be kept in the fridge but allow it to come back to room temperature before serving. This entry was posted in Afternoon Tea, Cake, Cinnamon, Decorating, Ginger, Syrup, Treats. Bookmark the permalink. My first thought was “yay, carrot cake!” second was “oooh, I like that pink tin!” Great post, as always, thank you! This sounds great, I love carrot cake! Thanks for showing how to make the adorable carrots! how long will the cream cheese icing keep in the fridge? 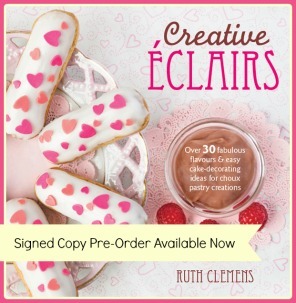 Ooo Ruth this looks lovely . The tiny carrots are the cutest thing I have seen in ages. It never crossed my mind to make them myself, they seem so easy. I can’t wait to try them. Thanks Ruth. Hi Ruth, I hate grating carrots too, and even if I found the food processor attachment, I doubt that I could figure out how to use it. A few weeks ago, I bought a Benriner mandolin (a Japanese brand) and it’s fabulous (you can find it on Amazon UK). I made carrot cake a few weeks ago and it took only a couple of minutes to grate all the carrots. I wonder though about how fine the carrots should be grated. I used the finest setting on the mandolin, but I see your carrots are more coarsely grated, do you think it makes a difference? I did think that you could not really taste the carrots in my cake. I love your carrot decorations! so cute! 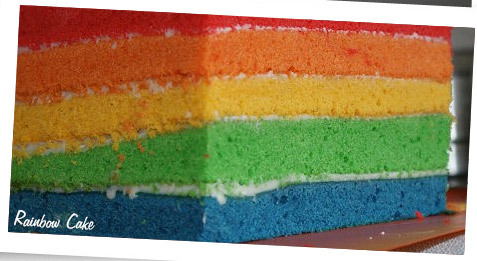 I would like to make a cupcake version of this delicious-looking cake, how long would you think I should bake them for? Also (that’s probably pushing it) but do you have any idea at all how many cupcakes this recipe would yield? Just made this & the cute little carrots too, thank you this is amazing! I will write ablog post about this! Love love love it! Can I use an 8″ round tin using this recipe? Baked this today and it’s a beautiful moist cake. Also, the cream cheese frosting was divine…..mine normally turns out to be too runny, but not today! Can you tell me, did you use a baking tray for your cake because I used 8×8 square as directed and my cake is twice as high as yours! I would like to make a traybake version of this but not sure if the mixture would be sufficient in a baking tray. Any advice would be appreciated. Great recipe, thanks. I baked this at the weekend and it was an immediate hit with my family. I’ve never been a fan of carrot cake so I left out the all spice and it suited my taste. The cake is really moist and I loved it. I followed the recipe for the cream cheese filling to the letter and it turned out perfectly. The ‘carrot’ decoration made my cake look very professional. I shall certainly be making it again. Hi, I really liked the look of your carrot cake recipe (especially how to make the carrots for the top) but was wondering how long this cake will keep for? Will it still be good to eat after a couple of days. Also, could I convert to gluten free? Hi can this cake be frozen ahead of time to be defrosted and used as one tier of a wedding cake in 4 weeks? (uniced) Thank you! 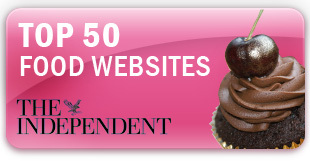 Love your site, recipes are great and have now realised cake decorating is easier than I thought!! I have a Tefal Fresh Express and couldn’t do without it. Makes short work of carrots, cheese etc. I make a lot of soup and carrot cake and it’s just a godsend. I’d definately recommend it. Made this last week, first time I had tried decorations of this sort and turned out quite well! Just wondered if you had advice on keeping the cake in a tin for a few days but not letting the decorations go soggy. There’s only 2 of us plus 2 year old twins so it takes us a few days to get throggh 16 pieces of cake! A quick question. I would like to make this as a birthday cake for my Mother-in-law. Could I make it a couple of days in advance and store it in the fridge. I know th cake will be fine but am worried that the carrots would go soggy if refrigerated . Hi Ruth, thanks for this – ave just made the cake and it smells delicious! When stored in the fridge should it be kept in an airtight container? 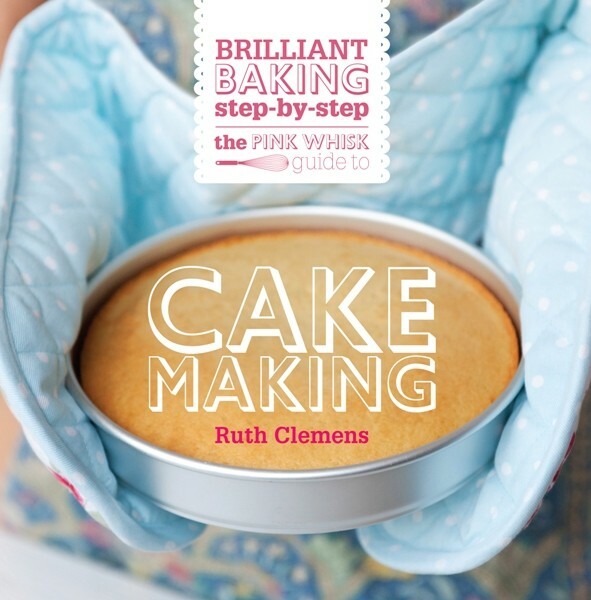 Sorry – might sound daft but I’m a novice baker! Ruth my kitchen smells amazing……. Thank you so much. Thanks to the carrot cake in the oven…. I baked this carrot cake for my hubby’s birthday last week. It was awesome . It was so moist n easy to do. But I excluded all spice as I didn’t have any. I even did the cream cheese frosting and the carrot topper. I used fondant instead . Thanks for sharing the wonderful recipes. I baked it today as per my father in laws request & it was just perfect! Tastes just like coffee shop carrot cake & I got lots of compliments! I had to bake a bit longer than advised tho – about 15mins longer but it was great! I also sprinkled some chopped walnuts on top – bliss! I love this recipe, I’ve made it as cupcakes and it worked well. I would like to try and make a gluten free version now and was wondering if I could simply substitute the sr flour for gf flour? Or should I add another raising agent?